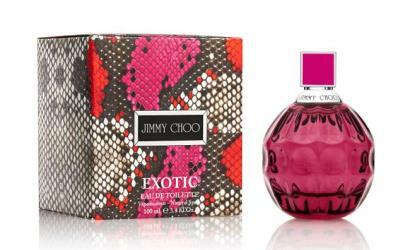 Jimmy Choo will launch a new limited edition fragrance for women, in July. Jimmy Choo Exotic includes notes of blackcurrant sorbet, pink grapefruit, tiger orchid, passion flower, floral notes, patchouli and raspberry. Exotic will be available in 60 ml Eau de Toilette. Jimmy Choo Exotic includes notes of blackcurrant sorbet, pink grapefruit, tiger orchid, passion flower, floral notes, patchouli and raspberry. Exotic will be available in 60 ml Eau de Toilette.